The finished knurling tool and a piece of aluminium that has been knurled using each end of the tool. This all started 20 years ago with a pair of diamond knurling wheels that had been given to me by a late uncle, they had moved around with me in a drawer of lathe tools. 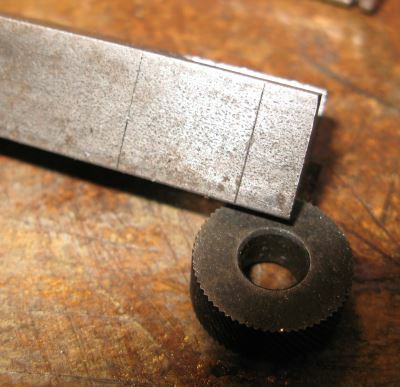 The knurling wheels along with a piece of 1/2” square mild steel – around 5″ long. Sorry everything is in imperial, but the wheels have imperial dimensions and so I stuck with it. The first task was to machine a 1/4” wide slot. 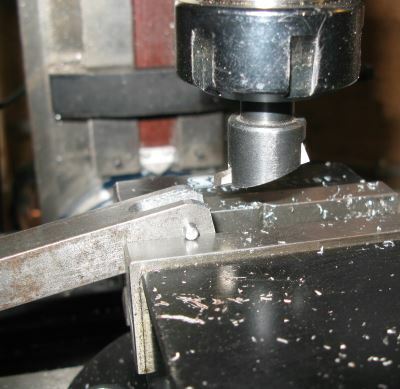 Here you see me using my Amadeal XJ12-300 milling machine held in a Soba vice that I reviewed some time ago. 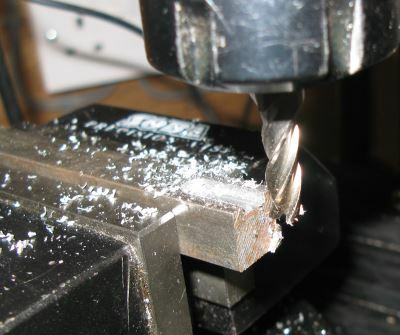 Spot the error….using an end mill when I should be using a slot drill. Just happened that this was a better match to the slot width that I needed and so I used it. I had the end of the bar protruding out from the vice so as to reduce the tendency to clamp the two sides together as the material gets removed. The slots have now been milled both ends and marked 1/2” back from the end of the slot for the hole that will accommodate the axle. The hole through the wheel is 1/4” diameter. to take 1/8” silver steel axle. In order to round off the ends of the main body I used a slightly longer piece of 1/8″ silver steel and located this axle on the top surface of the vice – this gives me a rotation centre for the main body. I then set the fly-cutter to the upper surface height of the main body. The bar through the hole allows you to gradually rotate the main body by releasing the vice, moving the main body down slightly and then re-clamping in the vice and taking a second cut. Then it is a case of repeating the procedure, rotate the part in the vice using the pivot as the reference and again flycut. You will have to turn the main body over to complete each end – this process is repeated until you get a rounded end at each end of the main body of the knurling tool. I usually finish this off with a file and carefully remove any burs. All of the parts ready to assemble. 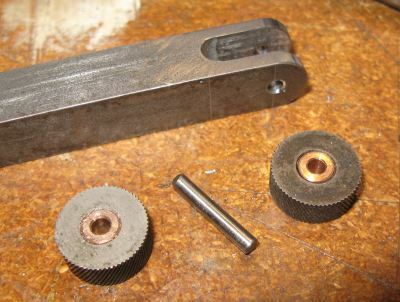 I put 1/4” phosphor bronze bearings in the centre of the knurling wheels, making sure they were a very tight press fit. The centre of the bushes were reamed 1/8” to take the silver steel axle. The silver steel axles were centre-drilled at each end so that I could use a centre punch to then lock the axle into the main steel body. 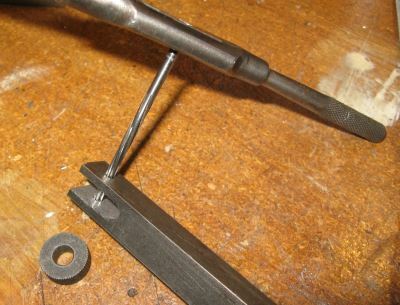 Once the knurl and axle were assembled into the beam I then flared the axle ends using a centre-punch. I found the easiest way was to fit one centre-punch in the vice pointing upwards, rested one end of the axle on this and then used a second centre-punch and a hammer the other end. It is best to rotate the part after the first strike and repeat – be careful not to over do this as you will lock the whole thing solid if you are not careful. 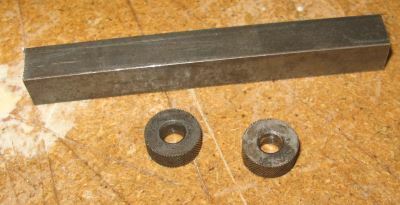 The left hand image shows the first cut using one end of the tool. I then turned the tool around to use the other end and repeated the knurl. Very nice work and thank you for your detailed construction notes. The notes were very useful.